We would like to cordially invite you to the first ever NC Wine Bloggers Summit! Join us for a day of discussion, networking, food, and wine. 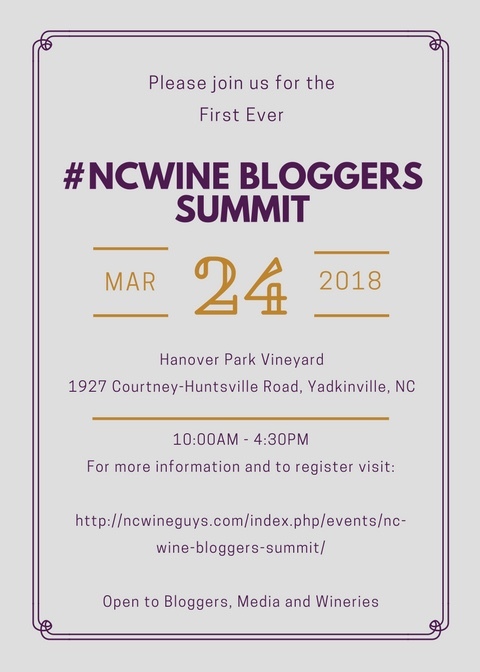 This event is open to any bloggers/media who blog/write about North Carolina Wine or plan to do so in 2018. We ask that you post at least two blogs/articles about this event. We also ask that you share with your followers on social media. We will close registration at 25 blogger/media and 25 winery participants. Wineries are encouraged to bring wine to share with the group during lunch and networking. 12pm – 2pm – Lunch / Networking; Participating wineries will bring wines to share. -How we can help wineries? -How they can help us? -Please come with your ideas. We want everyone to participate. We look forward to seeing you there. Thanks for all you do to support #NCWine! Hi guys – I’m planning on attending this event. Please let me know if there is anything I can do to assist with it. Sounds great; we’re looking forward to meeting you! Absolutely. Believe we may have met at the Wine Bloggers Conference. Cheers!